Arizona Black Rattlesnake right after a shed. I watched my Arizona Black Rattlesnake shed his skin late last night, and this morning took him out for some photos with his fresh, new scales. My wife Kelly took the pictures, and got some of the amazing iridescence in the morning light. This is truly the most beautiful rattlesnake I’ve ever seen … awesome awesome awesome snake! This entry was posted on Monday, June 28th, 2010 at 11:11 pm	and is filed under Captive & Husbandry. You can follow any responses to this entry through the RSS 2.0 feed. You can leave a response, or trackback from your own site. wow, that snake is beautiful. great capture…love that iridescence!! Thanks Larry, that rainbow sheen is hard to get on this guy. Most of the time the black is pretty matte, but for a few days after shed it has that brand new look to it and he looks amazing. Cerbs are definitely up there, but I’m with you on the molossus. They’re definitely my favorite. I found a killer yellow one yesterday in the New River mtns. Awesome! Get any good pics? I found one a couple weeks ago with blue eyes… is this normal or just a genetic phenomenon? Whoa, really? Did you get any photos of it? Was it possibly just pre-shed blue? I’d love to see it. Yeah I was able to get one halfway decent photo (it was a dark, drizzly day and the snake was in a crevice, and my cousins were pressing me to move on). I doubt it was pre-shed, because it’s scales were a clean, vibrant greenish-yellow. Can I email it to you? hey bryan i am michael hughes cousin the kid who u were talking to about the black tail (wich i spotted by the way) and i wanted to come with u guys to saddle mtn. to find gila monsters could i come? Nice cerb! I’m kind of partial to the ones without the yellow banding. Love the velvety look after a fresh shed too! They’re awesome. Too bad about the Utah thing … my two cerbs (not a single yellow scale between them) have been locking up since late June, and she’s certainly gravid. WOW! I like you am an avid molossus fan. 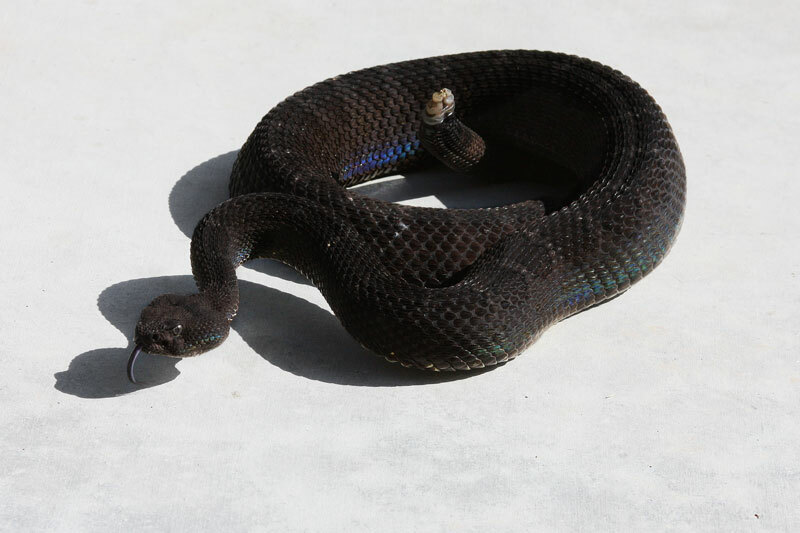 But that AZ Black is one of if not the MOST stunning rattlesnakes I have ever seen. Nice! Great website too! Thanks! He’s definitely one of my favorites. He lives with a female that’s just as black, and she’s gravid. I can’t wait to see what those babies look like.